Thank you for visiting Gruman Creations! 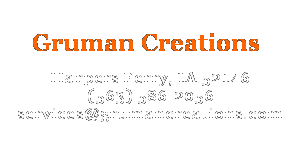 Send us a note to let us know how Gruman Creations can serve you. We are happy to answer your questions, or research any of your special requests. Please provide your information below. We look forward to hearing from you.